Once a video has been uploaded, the Contributor should fill in some basic information about that video. To get to the Metadata fields, click on the “Edit” option in the pulldown menu associated with a particular video. This takes you to the Media page, where the user will add Title and Short Summary (Required) and Episode ID, if relevant. Please note that the Title you assign to a video in TelVue Connect is going to be the filename of that video, once downloaded from TelVue Connect, whether for your own station, or through the Media Exchange. Additional metadata fields can be accessed through a separate Metadata sub-tab, seen from the Media Edit window. These fields are optional, unless your organization has subscribed to the CableLabs Metadata Feature in TelVue Connect. The Title and Summary fields from the Media Edit window automatically carry over into the corresponding Metadata fields. Run time is automatically calculated and filled in by TelVue Connect. Categories can be assigned to a particular video by the Contributor, but the categories themselves are managed by the Administrator. In a pull-down from the Administration tab is a “Categories” option, where the Administrator can create, delete, and organize the categories and their hierarchy. The Administrator can also choose to assign specific Categories to individual users. To do so, make sure that your Organization Settings –> Metadata –> Assign Categories option is enabled, and then when editing any individual users, you can assign categories on the Categories user sub-tab. 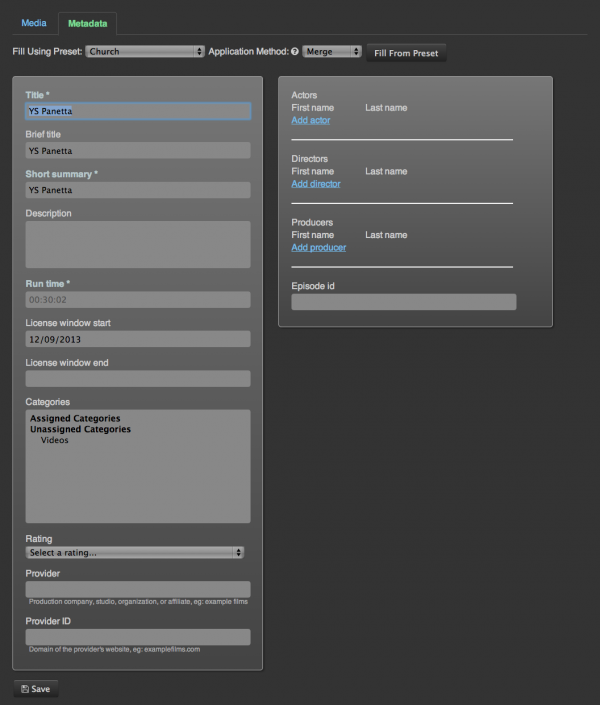 There are optional fields for more information, such as the names of actors, director, etc. A time-saving feature for commonly-repeated metadata fields in an organization is the Metadata Preset Feature.